You are here: Home / Latest News / News / Celebrate Our 70th Anniversary With Us! Celebrate Our 70th Anniversary With Us! 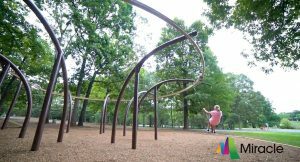 Paris Playground Equipment started in 1947, which makes 2017 the 70th anniversary of PlayPower Canada serving Canada! In a year full of events celebrating Canada’s 150th Anniversary, we are adding one more – the PlayPower Canada 70th anniversary promotion! This is a Limited Time Offer for Canadian Playground Buyers. It features great savings on Little Tikes Commercial play equipment and Miracle Recreation playground equipment. Check out the great deals play structures, independent events, and site amenities. To find out more, call your local representative toll free at 1-800-265-9953. 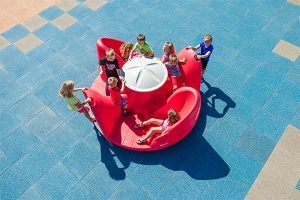 Make sure to ask about all the inclusive solutions, like the Revolution Inclusive spinner, Ten Spin, Tire Climb with Seats, and Generation Swing. Don’t forget to add a shade structure to protect the children from the sun! Also ask about other products featured in the vast PlayPower product line, like the Gravity Rail (shown below).